A Cognitive Bias is an involuntary pattern of thinking that leads to distorted perceptions and judgements that can result in errors in reasoning, logic and evaluation. This is often cited as a reason for people making sub-optimal or irrational decisions. Further, cognitive biases shape an individual’s “subjective social reality” as they inevitably influence how we interpret our experiences. Indeed, Kahneman uses the analogy of an optical illusion to explain how cognitive biases influence our decision making. We think how we see and as a result we process information and make decisions based upon our own expectations and perception of the world. 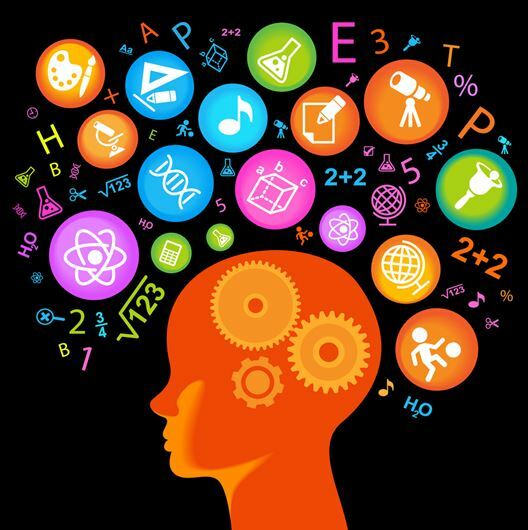 Kahneman and Tversky (1996) suggest that cognitive biases have particularly important implications in areas such as finance, management, entrepreneurship and clinical judgement. There are many different types of bias, some are information-processing shortcuts (i.e. heuristics), others act like filters to shut out what our brain considers to be noise, and some reflect the brain’s limited processing capacity. In addition we also have emotional and moral motivators, and social influences, such as norms and traditions. 1. Information overload – such biases include anchoring, attentional bias, bias blind spot and framing. Conversion strategy: Too much information or too many options slows user decision making and can lead visitors leaving a site without making any decision. Ensure you create a clear visual hierarchy and avoid offering too many choices to customers. 2. Insufficient meaning – such biases include cheerleader effect and hindsight bias. Conversion strategy: Lack of clarity creates uncertainty which people dislike immensely. Avoid using jargon or complex language that can limit comprehension. Ensure you effectively communicate your value proposition using simple language and relevant imagery. 3. Urgency of action – such biases include authority bias, Dunning-Kruger effect, and loss aversion. Conversion strategy: Make it easy for people to make quick decisions by having a prominent call to action and supporting evidence of trust and credibility (e.g. customer testimonials and other social proof). 4. What should we remember – such biases include the peak-end rule, suggestibility, implicit associations and implicit stereotypes. Conversion strategy: Avoid asking visitors to remember too much information. Ensure offer codes are not images and so visitors can copy and paste them into input fields. Provide clear tool tips for forms to remind people why you need information and follow standard web conventions so that visitors know where to look for certain types of information. We don’t see everything. As a result we may filter out salient and practical information. Our tendency to pattern match and look for meaning can create illusions. This often results in overconfidence about our knowledge and understanding of how events are connected or not. Interpreting correlation as causation is a common example of this truth. Fast, intuitive decisions can be flawed. Our intuition can often mislead us as we are prone to jumping to wrong conclusions and subsequently make poor decisions. Our memory reinforces errors. What we remember is selective and will naturally support existing beliefs to avoid cognitive dissonance. 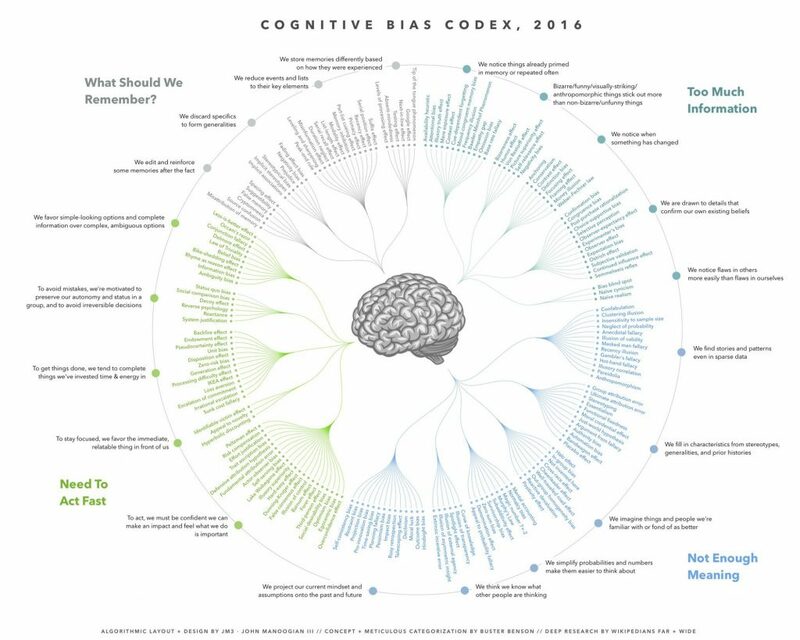 Here is a great graphic by John Manoogian III which shows all the cognitive biases as categorised by Buster Benson. Cognitive biases have a purpose and have evolved over time to help people deal with a wide variety of problems. Evolutionary pressures probably created these biases to help humans survive and prosper. Given our brain’s limited memory and processing capacity these problems still remain and so cognitive biases continue to help people respond quickly and effectively to a vast array of issues. This can sometimes result in poor decision making, but most of the time they probably help us avoid disaster and lead to satisfactory results from an evolutionary perspective. From a conversion rate optimisation perspective cognitive biases are relevant from two perspectives. We can use our understanding of cognitive biases to nudge visitors towards conversion goals by ensuring the user experience includes relevant interventions (e.g. social proof for the bandwagon effect). However, we must be careful about how we implement such interventions and ensure where possible that we use experiments to validate if they have the desired positive impact that we expect. Without such testing we will inevitably suffer from some of the same biases that we are trying to use to influence the behaviour of our visitors. Such decisions will result in a sub-optimal site and user experience. For an excellent summary of most cognitive biases and how to avoid them see the Cognitive Bias Survival Guide from Geekwrapped.